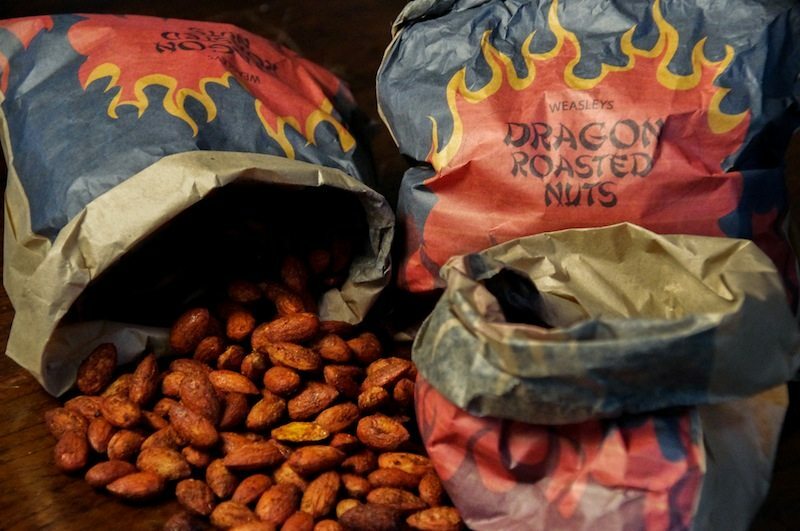 If a miniature dragon in a wizarding vending machine was to roast nuts and pop them out to you, this is what the nuts would taste like. 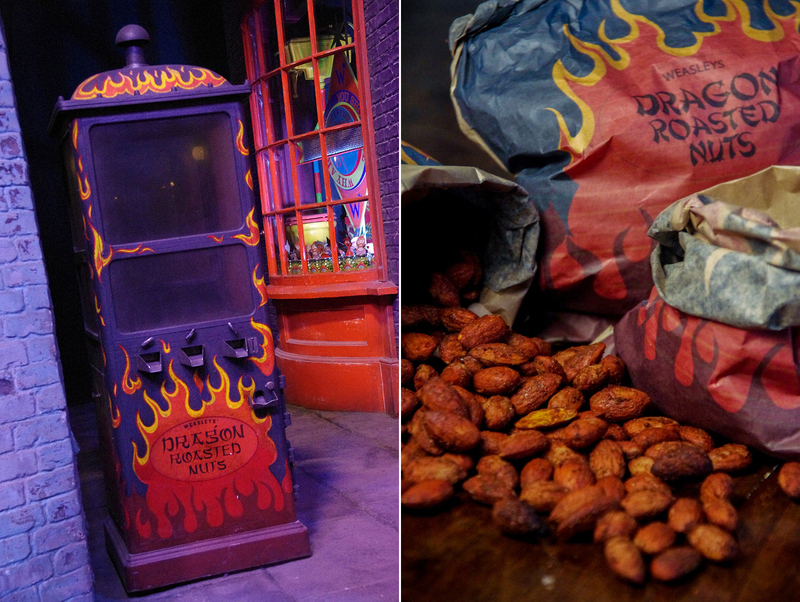 Weasleys’ Dragon Roasted Nuts was a coin machine outside the Weasley store found on Diagon Alley. How cute is that! 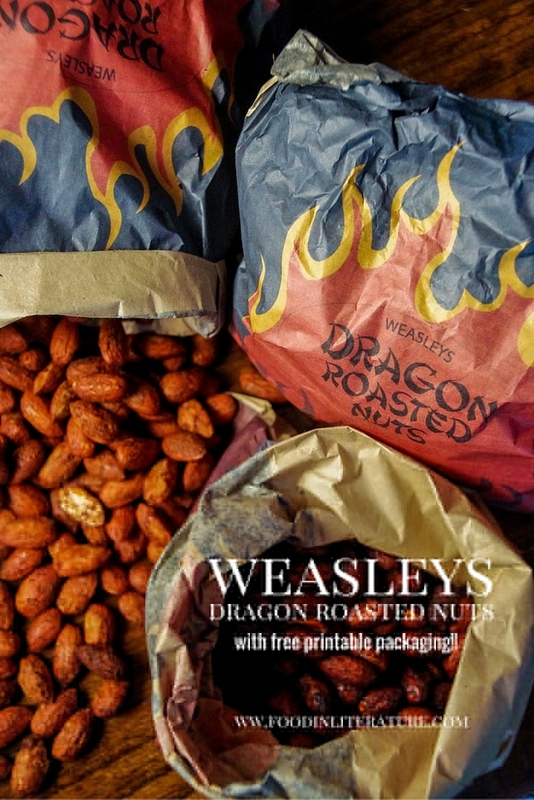 The dragon roasted chestnuts, but since they weren’t easily available (both the dragon and the chestnuts) when I went to the shops, we opted for almonds roasted in our oven. This sweet concept was found in the Harry Potter and the Half-Blood Prince movie, but wasn’t mentioned in the book. The packaging was designed based off of the machine seen at The Making of Harry Potter, and printed onto brown paper sandwich bags. I’ve turned the design upside down (I’ve make the design available to download for free at the bottom of this page), as I printed with the bottom of the bag first. I found the printer could grab hold of the bag’s bottom better than the top (because it could open and tear). The nuts recipe is a mix of spices, but with a good kick of cayenne and chilli. The chilli will add that ‘heat’, like a dragon has recently roasted them. Preheat your oven to 250F/120C. In one bowl, mix together your spices, sugar and salt. In another bowl, beat the egg white a few times. Add the almonds to the egg white, and using a fork, stir until all the almonds are coated. Transfer the almonds to the spice mix. I'd transfer using my clean hands, as I often have leftover egg white in the bowl. Using a fork, stir the almonds in the spice mix until fully coated. Transfer the coated almonds to the baking tray, and spread the almonds out, so they're not overlapping each other. Bake in the oven for about 50 minutes. You can cook them at a higher temperature, but only if you're watching them closely. They burn easily! thanks Chelsea. The packaging always seems to make it! Oh my these look so very tasty and right up my street! A friend made these for a Harry Potter party we had. They’re so good. Like I just want to keep eating them. Just the right amount of sweet and spicy. Great recipe. 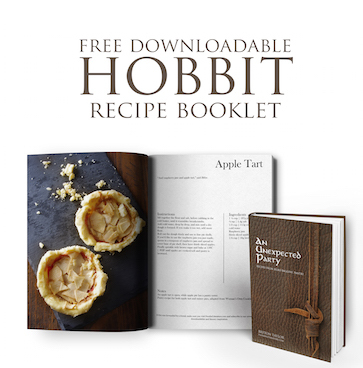 Can’t wait to try making them myself. I am super excited to make this for a HP night with friends!! Do you have instructions on how to print directly onto the paper bags? Do you tape it to the middle of a paper? Do you feed the bag alone in the center? Any instructions would be greatly appreciated! I fed the bag by itself through the printer, but I made sure the closed end went through first so it didn’t snag. What kind of bags did you use? Just brown paper sandwich bags from the grocery store. Did you just put the bag through your printer? What print settings did you use? Yup, just through the printer on normal settings. Just need to make sure the bag goes through from the closed end first so it doesn’t catch.